We have worked with Wedding Belles Llanfairpwll and Llandudno for over seven years. They are our longest served customer. Having completed a press release recently we thought is was a great opportunity to look back and forward with this great business. 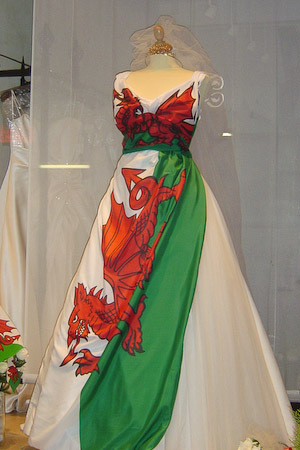 Diane and her manager Fiona Roberts created a wedding dress using two large Welsh flags. “It was the talk of the village, visitors stopped to take photos, and we received several delighted callers and encouraging cards,” says Fiona. 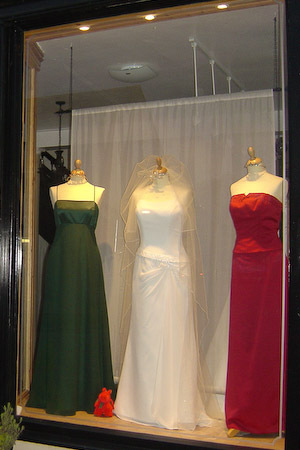 To Wedding Belles surprise, since the display was taken down, three genuine brides have wanted to try on the dress. The brides have been very disappointed to find it was made from a couple of flags. 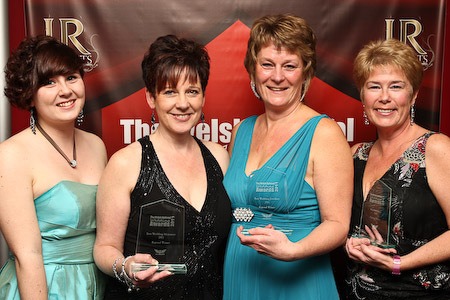 Wedding Belles have returned from ‘The Welsh National Wedding Awards 2011’, Llanelli with three awards, Northern Wales. The bridalwear company with bridal stores in Llanfairpwll and Llandudno brought home Best Bridalwear, Best Menswear and Best Wedding Jewellery. Congratulations to all, and especially to Ruth Williams of Network She for organising such a fab event,” said Diane Roberts, Proprietor of Wedding Belles. It is fantastic to continue to work with such a great business. “Wedding Belles continue to provide great customer service and a top quality product. It is a pleasure to work with such a dedicated and high achieving business,” said Jo Quinney, Director Q Marketing & PR Ltd. This entry was posted in Press releases, Public relations and tagged Network She, postaweek2011, PR, press releases, Public Relations. Bookmark the permalink.